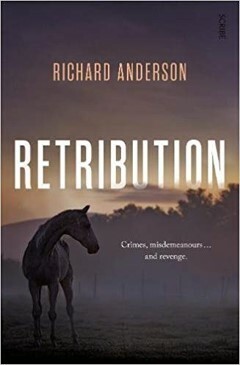 Retribution, Richard Anderson’s second novel, is a first class crime story with a difference. Crime drives the story, as do retribution and murder – but not in their usual crime fictional form. The novel tells the story of five people in the Australian outback whose paths through life meet and are changed for good or evil because of a remarkable and valuable horse. Her name is Retribution. Sweetapple is a cattle thief, Bob Statham a rich businessman, his wife Caroline a run of the mill politician, Luke a professional protester and Carson who is determined to satisfy the wild longings within her by escaping from the attentions of men like Bob Statham. Psychological tension builds and physical danger faces them all as they come together and face the outcome of their individual longings and actions. Although slow to build at the beginning, the novel was excellently written and plotted, holding my attention throughout. Retribution should not be missed.